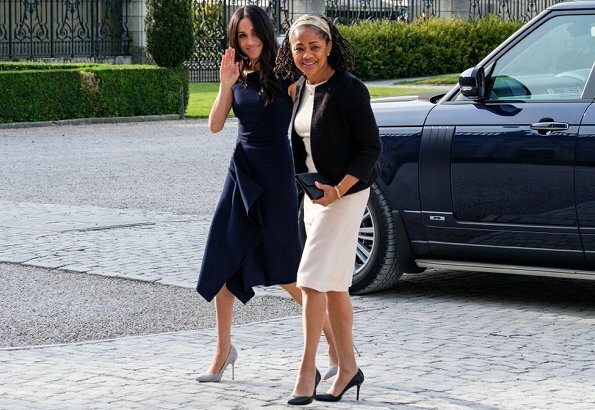 On May 18, 2018, Meghan Markle and her mother Doria Ragland, arrived at Cliveden House Hotel on the National Trust's Cliveden Estate in Berkshire near London where they will spend the night together before tomorrow's wedding. 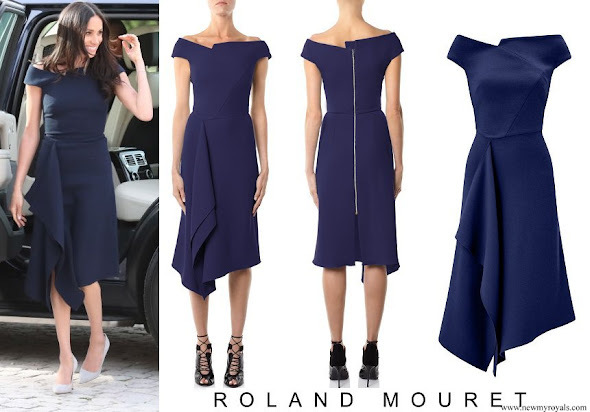 Meghan Markle is wearing Roland Mouret’s Barwick dress and Manolo Blahnik shoes. They both look lovely. I particularly like angles and drape of Meghan's navy dress Her mother has a very nice figure! Being a yoga teacher has benefits! Don't like Meghan dress. Looks like she wrapped a table cloth around herself. I like the top of this dress, but the skirt looks untidy. Tomorrow, at last, she'll forsake the dark colours----unless there's a very big surprise in store! Doria looks very kind. I hope tomorrow goes well. Meghen looks fantastic, but I must be honest Ms Ragland looks great super combination,black and tan shoes and bag are matching. I also like her hair. To Meghan and Harry the best for the future. Enjoy every one of us and best wishes to Harry and Meghan! I like both Meghan's dress and shoes. She looks very nice. Her mum also looks wonderful and she seems to be an intelligent, kind lady. I wish Meghan and Harry a wonderful wedding! Wow, beide Damen sind sehr elegant. Die Mutter sieht sehr nett aus. Ich liebe Meghans Kleid.